When I was driving in the countryside of England, I often found picturesque view unexpectedly. The view of West Tanfield was the very one of them. One day, when I drove along the A6108 northwards from Ripon, the road met the River Ure. I crossing the bridge over it, a splendid view of a small village came into sight suddenly. The houses roofed with red tiles, a church and its tower, and a small building like a keep of a castle stood closely. The village was West Tanfield. The church, St Nicolas', has its origin in about 1200. The tombs and memorials of the Marmions, who came here in 1215, remain there. The family built a castle there later, but noting remains except a gatehouse called the Marmion Tower. Later I knew this West Tanfield is one of the most enchanted villages in Yorkshire and very popular among photographers. Indeed, I understand why it attracts them. 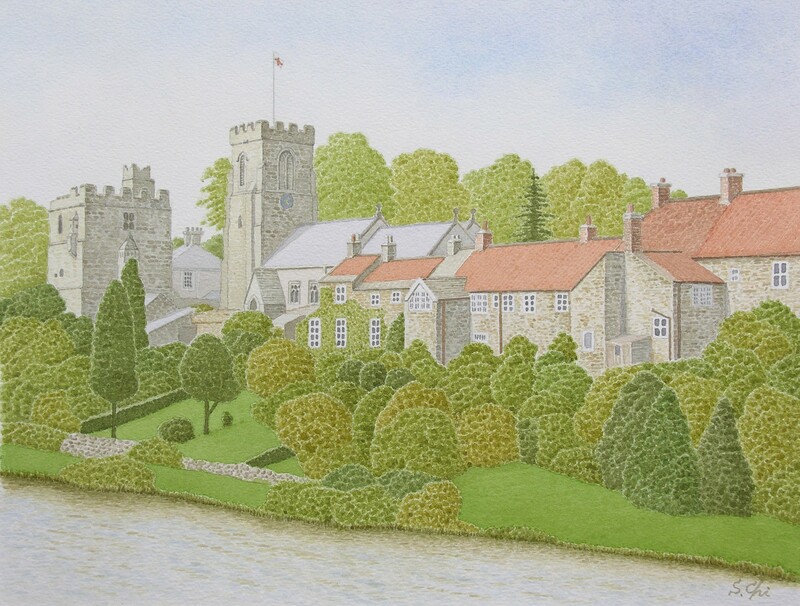 West Tanfield is a very picturesque place and a good subject even for painters too.